Different types of business firms and companies need the addresses of their clients and other associates enlisted in an orderly manner so that they find it easy to locate the place in times of need. 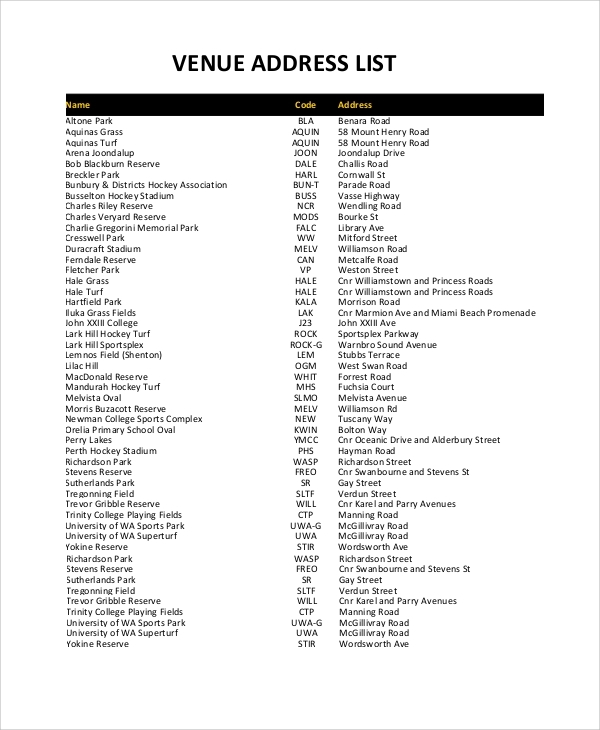 An Address List Sample contains all these addresses, and are commonly used when the professionals send letters, parcels or visit them for different purposes. The Class List Samples includes diverse groups of contacts of companies, and here are some of the commonly used templates. These address lists are used to send the invoices for different products and services. 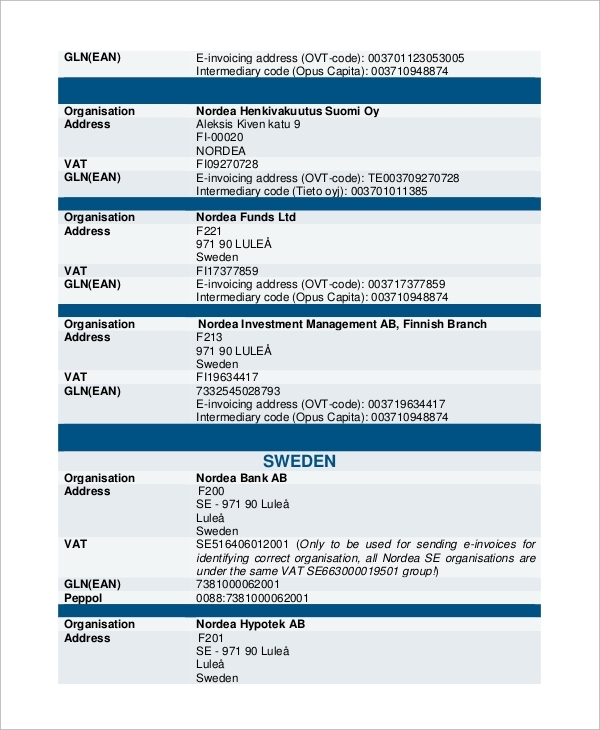 The addresses of the organizations are enlisted here with other necessary details like the OVT code. 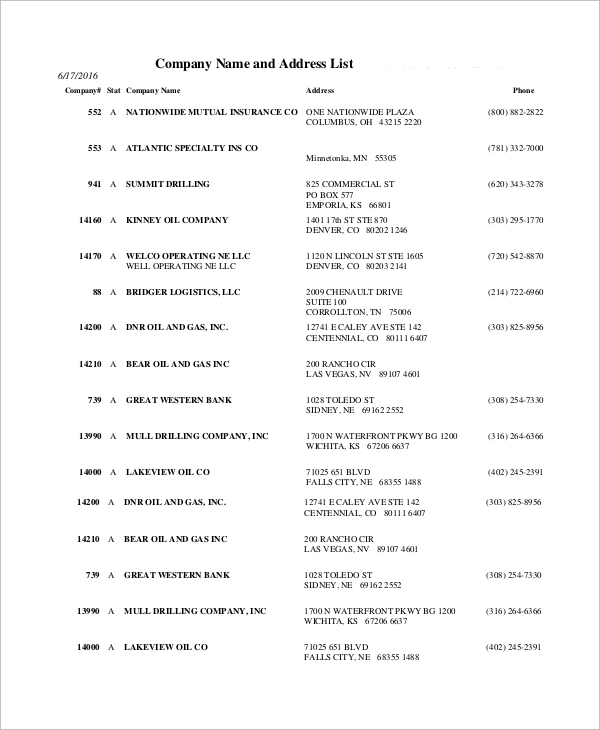 When an organization deals with different companies, they need this sort of address list. 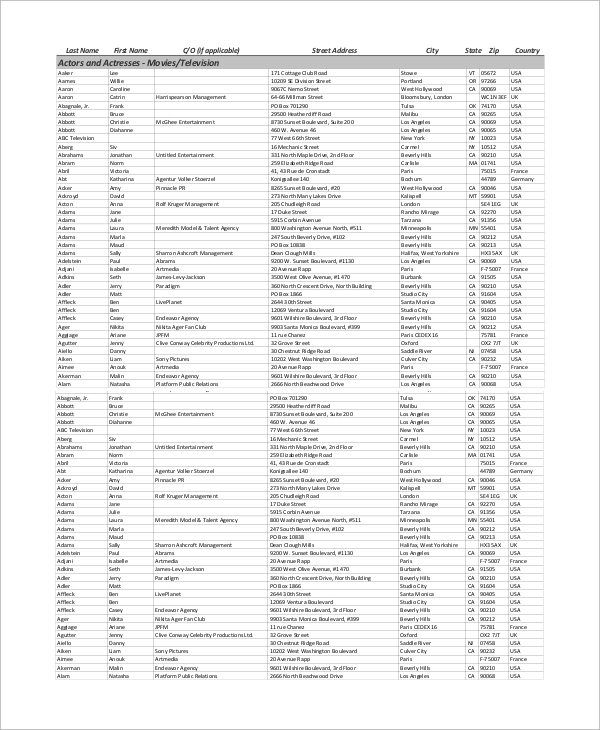 It contains the name of the companies, their addresses, phone number. The type of organization is also mentioned here. You can also see Task List Samples. 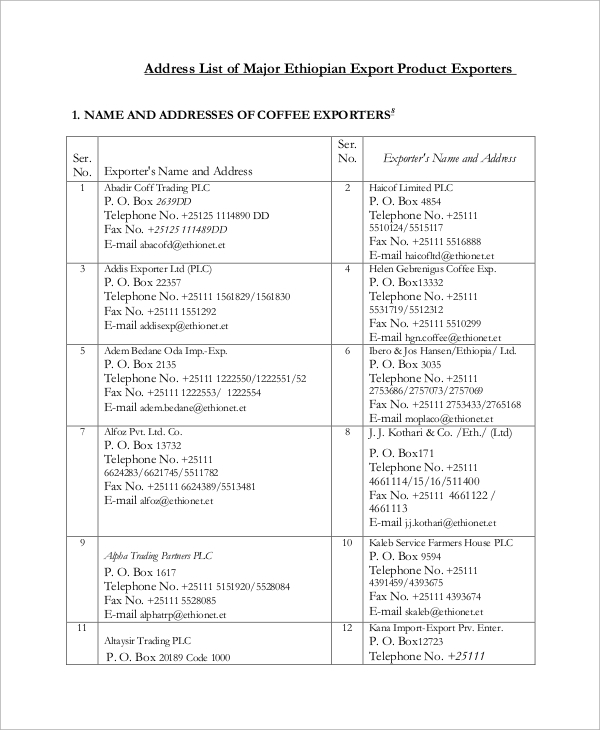 In this list, the exporter’s name and addresses are enlisted systematically. A tabular chart is used along with the serial number on the sides, and the necessary details are included here. Why are these Address Lists Important? It is much easy to plan an event when you have all the necessary contacts with you. For wedding purposes, people need to invite different people and send invitation cards to their homes. So, they need to use the wedding checklist template to get the address. It ‘s hard to remember the individual addresses, and when you organize it in the form of an address list, it becomes simplified to deal with the task. The chance of missing out a party is minimized. You can also see the Reference List Samples. Different companies choose the venues for corporate programs and other events. 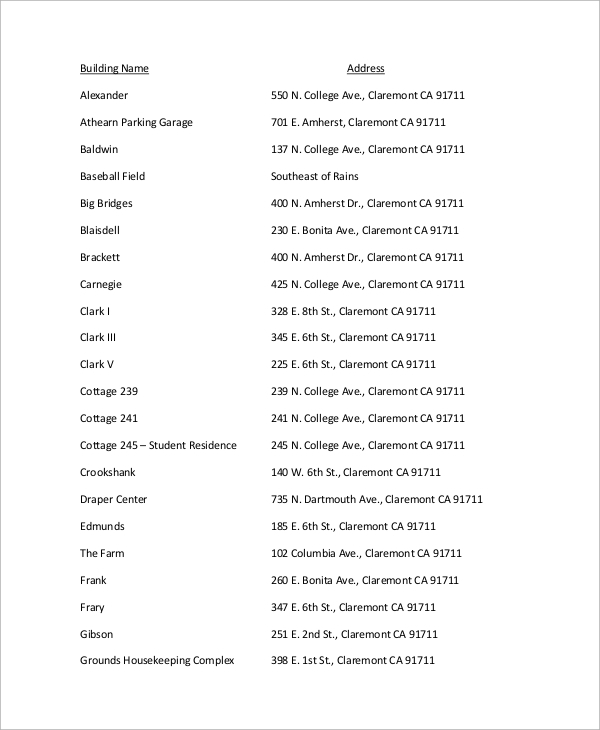 Here, the venues are listed up along with the addresses. The name of the suburb where it is located and the postcode are also mentioned. Hospital address lists are required by commoners as well as different organizations. In these lists, the names of different hospitals are enlisted along with different codes. 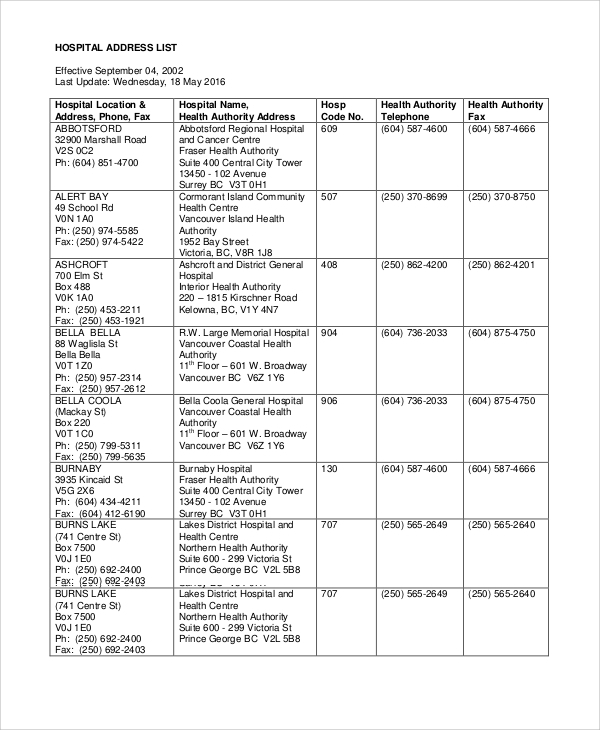 It is easy to locate the hospitals by using these lists. How to Arrange the Names Properly? In Wedding List planning templates and other address lists, people need to organize the information correctly so that the ease of accessing the information is unhindered. A printable wedding checklist can be arranged in a convenient way to maintain the ease of accessibility. For instance, you can go for the alphabetical order if you want, or divide the list into different groups according to geographic location or other criteria. In the end, it has to be ensured that the organizers get maximum benefit from the systematic arrangements of addresses in these lists. On the other hand, when there are seminars and conferences in companies, they invite different people with the help of these lists. For production and sales purposes too, these lists are quite handy to them. Address lists templates are of different types, and these are customizable according to the requirement. You can check out all these templates from the website. 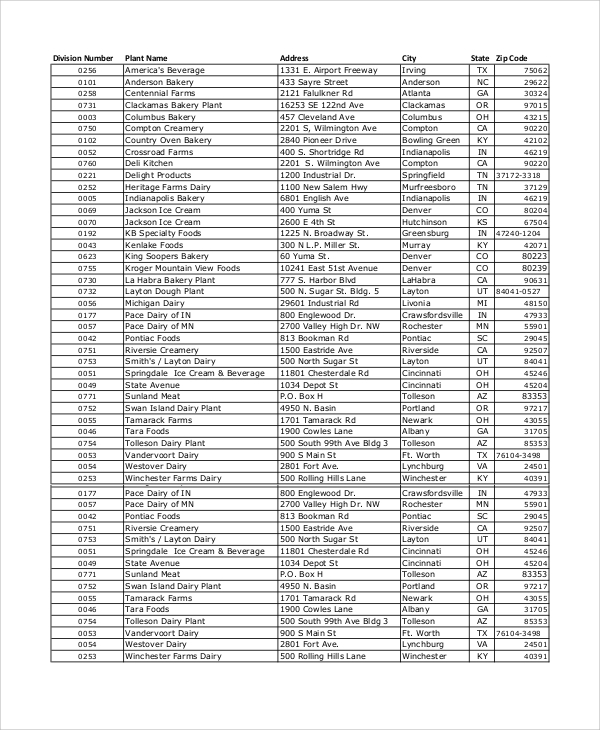 All the varieties of address lists including Supply List Samples are there for you. The address lists speed up the task of dispatching documents and products to different areas for circulation.